A pair of photos released over the weekend show an alleged mute button for Apple's upcoming "iPhone 7," possibly reinforcing claims that Apple will offer the device in Space Black, or at least a darker shade of Space Gray. 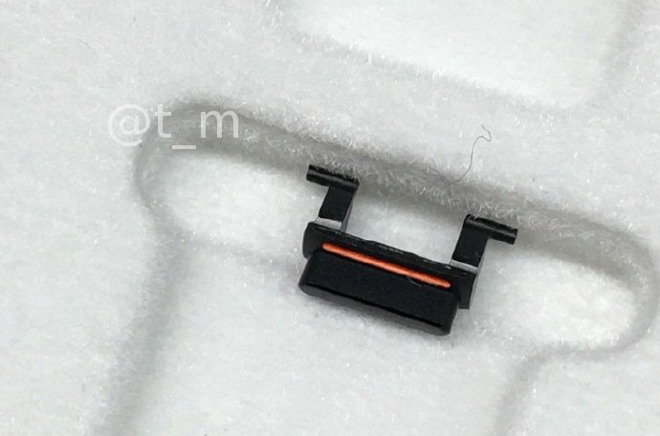 The source of the images didn't offer more information, except to say that the part comes from the same company supplying SIM slots for the new iPhone. Various reports have hinted that Apple might change up its colors this year, although others have suggested Apple will keep its range intact. A Space Black iPhone would further mirror the color options available to Apple Watch buyers, following the addition of Rose Gold with the iPhone 6s. Apple's colors are increasingly consistent across its product lines, with equivalents on 12-inch MacBooks and Beats headphones. Apple, however, hasn't sold a black iPhone since the iPhone 5. Indeed the company is thought to have transitioned to Space Gray for the iPhone 5s because of the difficulty in applying black coating. A new color could add slightly more appeal to the "iPhone 7," expected this September. Although the "7 Plus" may have a dual-lens camera and a Smart Connector, the regular model is predicted to be a modest upgrade with a faster processor, a better single-lens camera, and some other design tweaks, along with a higher 32 gigabytes of default storage.